ARTBA President and CEO Pete Ruane, left, and members of the Michigan Infrastructure & Transportation Association. 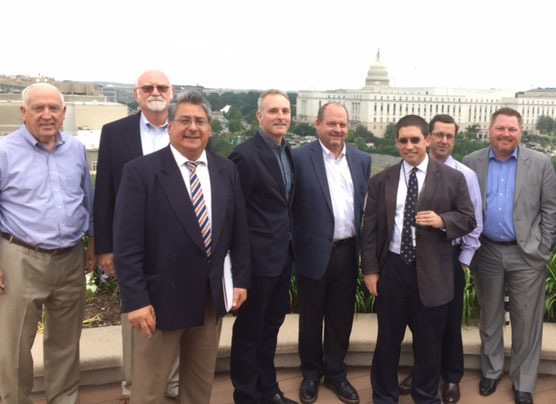 Members of two ARTBA chapter affiliates recently made their annual visits to Washington, D.C.
Fellows from the Illinois Road & Transportation Builders Association’s (IRTBA) “Emerging Leaders Program” (ELP) visited the Nation’s Capital on May 17. The IRTBA ELP program, modeled after ARTBA’s Industry Leader Development Program (ILDP), helps rising industry executives play a greater role in promoting, protecting and improving the future of the transportation design and construction industry. ELP fellows also visited with their members of Congress. On May 23, members of the Michigan Infrastructure & Transportation Association (MITA) also visited their congressional delegation and also stopped the new ARTBA headquarters for a reception. Both groups received briefings from ARTBA senior staff covering current legislative, regulatory, policy and market issues, including remarks by ARTBA President and CEO Pete Ruane. ARTBA encourages other affiliated chapters and members to bring groups to Washington, D.C. The association will provide briefings on the latest industry news and trends, arrange visits with high-profile policymakers, and host receptions at our new headquarters rooftop with a view of the Capitol dome.